I wish you all a very happy new year filled with love and peace. Today's post is about the top 15 beauty products that managed to be in my yearly favorites list for 2015, the products and tools I used and enjoyed the most the last year. So let's see them. First of all I'd like to start with the perfume. Black Opium by Yves Saint Laurent. This was love with the first sniff! Really! lol. I was at the Sephora with my husband trying out perfumes, and at some point he brought me this beautiful bottle and asked me to smell it. At that moment I fell in love and it reminded me my other favorite Flowerbomb but more oriental.and spicy. I don't know about the original Opium but this one I believe is a crowd pleaser. I'm sure everyone would love this. If I had to describe the scent I would say a blend of floral and fruity notes with a hint of woody notes. Let's move on to the favorite makeup products. Here I have a foundation and a concealer that I used the whole year non-stop Make up Forever HD Foundation and MAC Pro Longwear concealer, especially the concealer, the one you see in the pic is my second bottle and is new. The previous one lasted me a year and a half! A little goes a long way. It is as it's name suggests, longwearing and gives full coverage. The HD foundation on the other hand doesn't give full coverage, it's more of a medium coverage but it is so natural looking and undetectable on photos. ...and these are my favorite tools to apply foundation and concealer, the MAC 130 brush and Beauty Blender sponges. The MAC 130 I use only for contouring with cream products and its one of the best I've used so far and of course the Beauty Blenders I use almost for everything, application of foundation, concealer, contouring and to apply highlighter powders on my cheekbones. 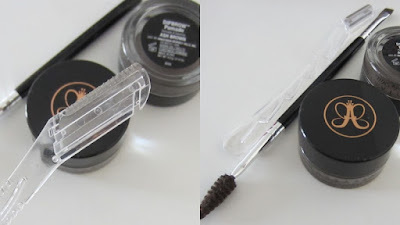 As far as brow products Anastasia Beverly Hills Dip brow Pomade along with the double ended brush #12 are second to none. I used to use MAC's brow pencil and swore by it but since I got the brow pomade I rarely use the pencil. I also loved using brow razors to shape my brows. A nail polish that suits any skintone at any season, I'm talking about the Essie Ladylike, an elegant soft mauve nail polish. No need for words, the shade speaks for itself. In 2015 women were all about matte liquid lipsticks and lip pencils. The trend was and still going strong. Overdrawn lips with a lip pencil like Kylie Jenner used to do. Of course many lip pencil shades mostly from MAC became more and more popular and sold out everywhere so I had to try some of those. Soar, Whirl and Morning coffee were the ones I got and really enjoyed using especially the latter which is longwearing. I also loved using liquid lipsticks and the ones I liked the most were Aromi Beauty in Toasted Almond a vey liquidy with a matte see-through finish and Anastasia Beverly Hills in Pure Hollywood a creamy with a matte opaque finish lipstick. Below are the swatches for the pencils and lipsticks. and last but not least is a favorite hair product that my hair can't live without, Macadamia Natural Oil Deep Repair Masque. 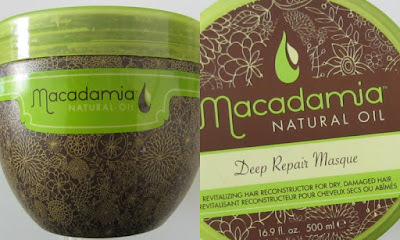 This mask makes my frizzy hair soft and shiny without weighing it down.